With the engine running，the distributor shaft and distributor cam rotate. This causes the cam to open and close the contact points. Since the points are wired to the primary windings of the ignition coil，the points openand close the ignition coil primary circuit. When the points are closed，a magnetic field builds in the coil. When the points open, the field collapses and voltage is sent to one of the spark plugs. With the distributor rotating at on-half engine rpm，and with one cam lobe per engine cylinder, each spark plug fires once during a complete revolution of the distributor camshaf t.
An electronic ignition system，also called a solid-state or transistor ignition system,uses an ignition control module and a distributor picking up coil to operate the ignitioncoil. The pickup coil and the module replace the contact point. An electronic ignition system is more dependable than a contact point system. Thereare no mechanical breakers to wear or burn. This helps prevent trouble with ignitiontiming and dwell. 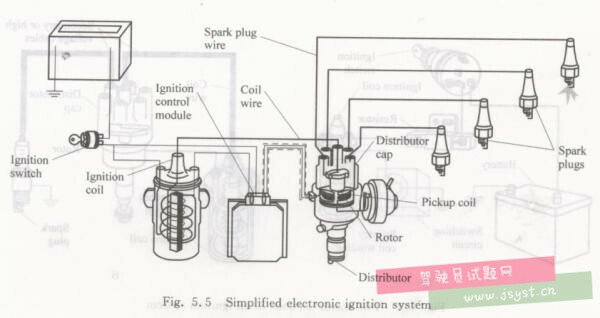 An electronic ignition is also capable of producing much highersecondary voltages than a contact point ignition. This is an advantage because wider sparkplug gaps and higher voltages are needed to ignite the lean air-fuel mixtures now used forreduced exhaust emissions and fuel consumption. With engine running，the trigger wheelspins inside the distributor. As the teeth pass the pickup，a change in the magnetic fieldcauses a change in output voltage or current. This output voltage，which represents enginerpm，is sent to the ignition control module. The ignition control module increases thesetiny pulse into on/off current cycles for the ignition coil. 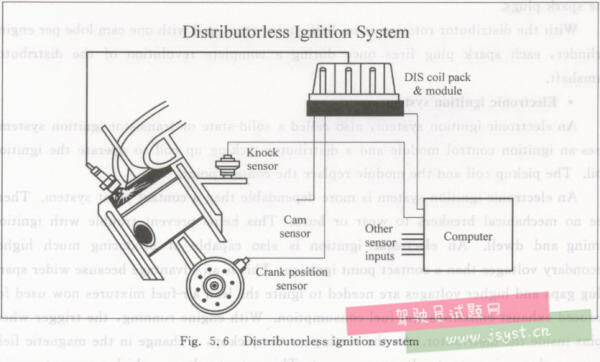 When the module is on, currentflows through the primary windings of the ignition coil, developing a magnetic field.Then, when the trigger wheel and pickup turn off the module, the ignition coil fieldcollapses and fires a spark plug. A distributorless ignition system, also called a computer-coil ignition, uses multipleignition coils，a coil control unit，engine sensors, and engine control module（ECU) tooperate the spark plugs. A distributor is not needed in this system. An electronic coil module consist of two or more ignition coils and a coil control unitthat operates the coils. Each coil in the coil module serves two cylinders. Therefore, afour-cylinder engine would have a coil module with two ignition coils. A 6-cylinder engine,on the other hand，would need a coil module with three ignition coils. When the computer and sensors send correct electrical pulses to the coil control unit,the control unit fires one of the ignition coils. Since each coil secondary output is wired totwo spark plugs，both plugs fire. One spark plug arc produces the power stroke. Theother arc does noting because its cylinder is on the exhaust stroke: burned gases are simplybeing pushed out of the cylinder. When prompted by the computer and sensors，the soil control units fire the nextignition coil. Another two spark plugs arc produce one more power stroke. This process isrepeated over and over as the engine runs.